If you look at any of my pictures, I always wear several bracelets with each outfit. I feel a simple bracelet can and should be layered depending on the style you are going for. I sometimes wear them with a watch or simply layered on my right arm. And lately, I love mixing different metals. My very favorite bracelet was a gift from my Italian Grandfather, Luca. It is gold, a bit dainty and very intricate. So when Evine, an online shopping network (check them out here) asked me to be feature some Italian jewelry, and talk about their live shows from Vicenza Italy 9/13-9/16, I was very excited. This is the first time in over 15 years that Evine is broadcasting live from Italy and these awesome bracelets, exclusive to Evine, will be featured. The bracelet’s are part of the Toscana Italiana Jewelry line and come in different styles and offer this incredible adjustable slide feature that I love. The most popular silhouette from Toscana Italiana. One size fits most as it adjusts open to 10” for easy on, easy off wearability. Available in 5 different chain designs and three plating options – Gold Plated, Platinum Plated, and Rose Gold Plated. 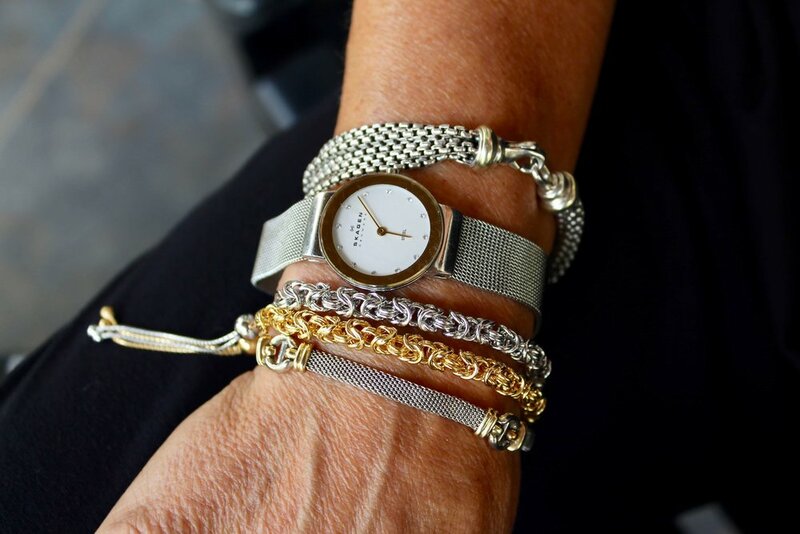 Pair back to any watch or bracelet for a stacked look. Classic Italian chains with a modern flair. 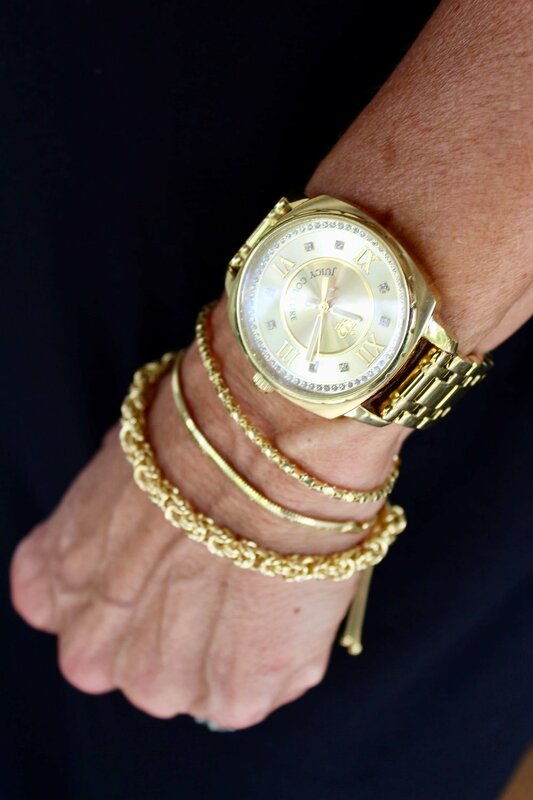 This pretty Margherita rose gold bracelet (in the middle) compliments my watch and another bracelet! The second bracelet underneath my Tiffany bracelet is the Silvertone Byzantine and the next is the Silvertone Margherita. This photo features (from the bottom up) Goldtone Byzantine, Corcana and Margherita. and my personal gold watch! I have paired the Silvertone and Goldtone Byzantines for a mixed metal look. Good news for you is that Evine is offering Silver is the New Blonde® readers a 15% discount. Please use the coupon code: Silver15. If you are looking for a great little bracelet that will compliment any style or your favorite personal jewelry, I would suggest shopping this event. I am also giving away three of the bracelets on Instagram. All you have to do is follow me @silver_isthenewblonde and @evinelive to qualify. You will find all the rules on Instagram today! Thank you to Evine for sponsoring this fun post. I hope you tune in to the Evine Live Broadcast tomorrow, through 9/16. Here is the channel finder for the live broadcast!